Are prices scaring off potential cigar smokers? I was recently reading the latest issue of Cigar Aficionado and was struck by the lack of affordable smokes. Maybe I’m just getting old, but I seem to remember a time when a significant portion of cigars were available in the $3-5 range. In the October issue, 77 cigars were reviewed; only one cost less than $5, and only 25% were listed as costing less than $7. Maybe it’s just the cigars CA chooses to review. But then again, Cigar Aficionado is many smokers’ first step into cigardom, meaning that these are the first prices many new smokers see. No matter what the reason, I worry that high prices are scaring away potential cigar enthusiasts. So then what’s an “average” cigar? Speaking of Cigar Aficionado, have you ever read their descriptions of what their numerical ratings actually mean? According to CA, a rating of 70-79 means “average to good commercial quality” and 80-89 indicates a “very good to excellent” smoke.” Yet I’m not sure I ever recall a cigar getting lower than 80 points in the magazine. While it has been quite awhile since I took a math class, I’m pretty sure it’s mathematically impossible for every single score to be better than average. Some cigar industry folks I spoke to were quite surprised when a year ago the Davidoff Oettinger Group announced their acquisition of Camacho Cigars. It was particularly surprising for some given the brands’ seemingly opposite cigar-making philosophies. Camacho is known for intense, full-bodied, flavor-forward cigars, while Davidoff’s cigars are usually characterized as nuanced, complex, and often on the milder end of the spectrum. 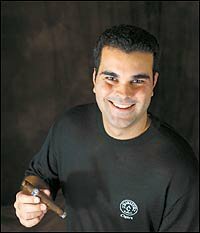 We’ve already discussed the reasons for the acquisition, but there’s at least one additional way that it makes plenty of sense: With the late great Zino Davidoff no longer around, and Avo Uvezian well passed retirement age, the company now has a youthful cigar ambassador in Camacho’s Christian Eiroa (pictured) who can be groomed to fill those immensely respected shoes. These days there are relatively few breakthroughs when it comes to the technical aspects of cigar making. One area where we see occasional innovation, however, is in cigar shapes. Two such examples are the chisel, pioneered by Litto Gomez of La Flor Dominicana, and the Nub, created by Sam Leccia (with Oliva). Since the Nub debuted, a few other companies have created cigars clearly designed to imitate the short and thick shape. (I’m told some in the industry derisively call these cigars “Snubs.”) Yet, to my knowledge, curiously no company to date has copied the innovative chisel shape. There are two B&Ms I frequent and you have either know what you're looking for or do a bit of searching to find cigars for less than $8. There's no shortage of $13-18 sticks, though. I don't think its an issue of trying to push the more expensive cigars, I just think that after taxes the average price of a premium handmade is about $10. I Enjoyed reading your artical on expensive and inexpensive cigars.I remember when good cigars were not as expensive as they are today.The average price I pay for a cigar is between six and twenty dollars.I will always enjoy a good cigar now matter what the price maybe. I think Victor Sinclair, one of CI's house blends, has copied the chisel shape. Stogie Guys ROCK!! On the topic of the chisel shape, La Tradicion Cubana makes what they call a 'reed' shape which is somewhat similar. I think Fuller's has'em. I think one of the high points of the cigar industry is the fact that it has reached a point of stabilization. Similar in fact to the wine industry, where the occasional gimmick comes about, but most connoisseurs stick to tried and true methods and products. Yeah you are right Germs, Victor Sinclair '55' comes in a chisel shape sold as "extreme"
Have you checked out the new Pepin Garcia "La Aroma de Cuba" or a cigar called "Los Patriotas"? 2 cigars that won't set off the heat sensors in your wallet too bad. Beefy but not as overpriced as most.What is your choice for what we like to call "The Crapper of the Month"?Vaya Con Dios! Maybe Texas has lower taxes than some states, or the Spec's Liquor Warehouse I shop at makes enough money off booze to not mark up the smokes much, but I generally see good solid brands for $4-$8 a stick at most. I don't tend to notice a lot of the more unusual vitolas, though. Mostly classic shapes.